I miss a lot of amazing golden hours because I put my son to bed right at the moment that the sun goes down. However, he was tired on this night and went down easy, and when I walked out onto my patio to breathe my sigh of relief that the mommy day was over (all moms out there know what I'm talking about LOL), I saw this beautiful scene and raced back in to collect my camera before it was gone. 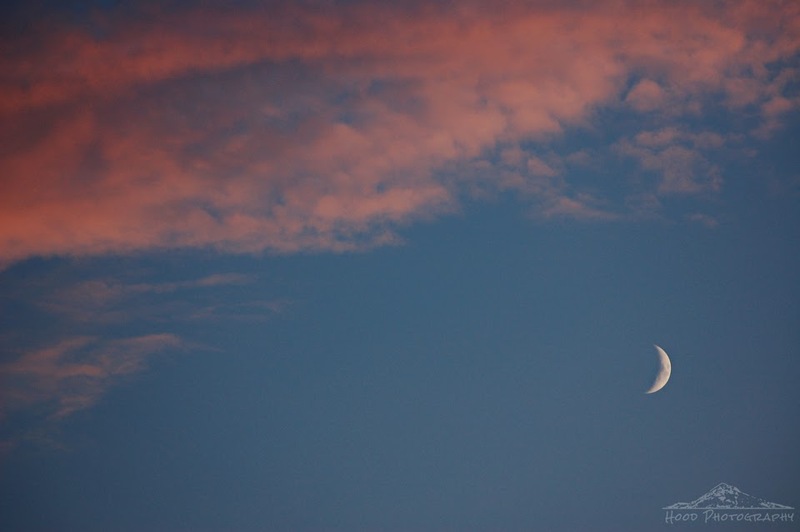 The sliver moon stood out below the pink clouds so beautifully. What a wonderful end to the day! Beautiful, beautiful. And yes, even as a grandmother, I remember the relief when the children finally went to bed, to sleep. What joy to capture that sunset just at the moment of peace at the end of the day. What a beautiful way to end the day indeed -- and, yes, as a mother of four, I too, know what you mean about Mommy time -- even though mine are all in their 40s now!! Enjoy those moments -- always! Have a great weekend! Fabulous, and all the more precious for being an infrequent sight, I'll bet. I love that little sliver of moon! Glad you didn't miss it.